For a feature writing class I took in the fall of 2003, we had to write a story about a place. I chose Michael Jordan’s high school, driving to Wilmington, N.C. on a weekday (it was fall break so we had no classes on Friday and Monday). I talked to Jordan’s former junior varsity coach and noticed something odd about the trophy case outside of the basketball gym. It looks like just an ordinary high school trophy case. Glass windows. Wooden frame. Sure there are plenty of track and tennis trophies. There is just one photo on the bottom left side, which was taken of the men’s basketball team that went 24-8 in 1999 and lost in the state finals. But nothing in the case gives any indication of the man who once played in the gym behind the modest trophy case. The man who won two Olympic gold medals. The man who everyone in America has talked about at one time or another. Even people in China know his name. So where are the trophies with his name on it? Where is his retired jersey? 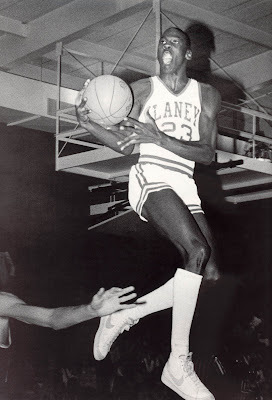 Certainly some things have changed since Michael Jordan graduated from Emsley A. Laney High School in 1981. As I drove about 150 miles down Interstate 40, from Chapel Hill to Wilmington (the same trip Jordan made when he attended the University of North Carolina at Chapel Hill) and pulled into the entrance of Laney High School, it seemed as ordinary as the trophy case. There was a sign that read: “Home Port of the Buccaneers.” On both sides of the winding entrance road were dozens of Carolina pines, with an even greater amount of pine cones on the ground. In fact, with the random assortment of pine trees, there were spots with more brown pine needles than grass. I found one of the many open parking spaces in the lot in front of the school. I looked to my right and saw a white student step out of his mother’s minivan. He was wearing a Kobe Byrant jersey. I wondered to myself whether Jordan still has the mystique he had with students a decade ago. Jordan, old school? Lynch, who also teaches history, is one of five teachers that taught when Jordan attended Laney High and is still teaching. Back then he was a good player, at least his freshman and sophomore years, but not a player that would receive recruiting letters from Dean Smith. As Lynch recalls, it wasn’t until Jordan was a senior that hordes of media and recruiters journeyed to Laney High, a building with faded brown bricks and white trim around the windows and roof. Walking through the hallway with my bright yellow “visitor” sticker on, with a picture of a buccaneer, I passed through a set of double doors and was outside. I walked through another set of double doors directly in front of me into the gym. There was the trophy case – the one I kept looking through, but couldn’t seem to find the name “Jordan” anywhere. Lynch informed me that the case used to contain Jordan’s royal blue and gold high school jersey and a plaque with his team that won the conference title Jordan’s senior year. It was all stolen from the case when he was on the Chicago Bulls, so they don’t put any more Jordan memorabilia in the case. The only indication of Jordan attending this high school was a photo of him hitting the winning shot against Georgetown in the 1982 title game, which I saw hanging in the main office. But there were two more obvious indicators I soon noticed. Inside the gym, which seats about 1,200, there is a mid-1980s photo of Jordan dunking on a fastbreak. The photo is about twice as big as the glass backboard that is right of it. Other than the photo, it resembles any other high school gym across the country. The student body has increased from 1,200 to 1,800 since Jordan was at Laney, but has the gym changed since he played there? Some of the performances Lynch witnessed were anything but regular. For instance, the time Laney High was in a Christmas tournament game, trailing its opponent by about a dozen points in the fourth quarter ... Jordan scored the final 15 points in the game, and hit the jump shot to win it. While the inside looks ordinary, the white letters that are the same size as the “Laney High School” letters as the “Laney High School” letters on the brick building outside say, “Michael J. Jordan Gymnasium,” which honor was bestowed upon Jordan after he won his sixth NBA title. Since Jordan graduated, the Buccaneers have had better teams than when he played there, such as the 1999 men’s team that reached the state finals. “It’s kind of ironic that we’re able to do some things that we didn’t do when he was here even though he was the best player we’ve ever had come through here,” Lynch said. Still, the students haven’t changed much since Jordan was there, Lynch said. They come from many different economic and racial backgrounds as I saw when white and black students jogged around the baseball field, located behind the gym, during physical education class. In the student parking lot you have your typical beat-up family cars with a Mercedes here and there.